I’ve always struggled to finish projects that require patience. 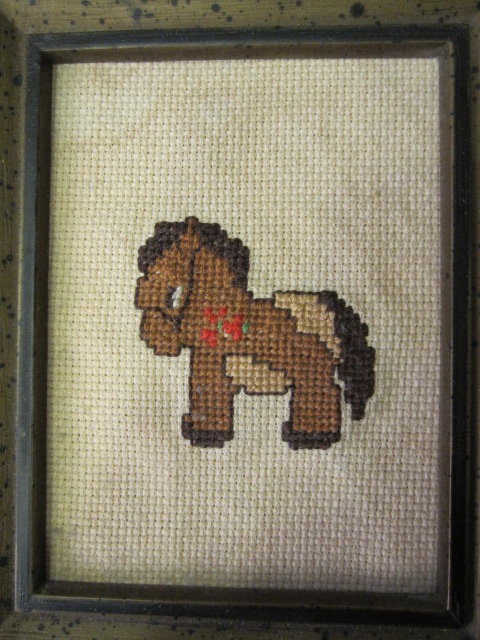 When I was just learning how to sew, I was so unable to sit still and focus on stitching x’s that my mom finished this itty-bitty horse for me. I was the type of student who had messy handwriting. Teachers would write “Slow Down!” on my papers. (Lily’s first grade teacher writes the same thing on her papers. Hmmmm.) Instead of drawing out individual cells in my biology lab notebook, I would get frustrated and resort to scribbles. Sitting down and having to mix paints and make an elaborate color wheel in art class just about did me in. As a teacher, parents called me patient. As a mom, I’ve also had to develop some sort of patience. But it’s a different kind of patience; a patience I’m not all that good at, either. So I surprised myself when I completed April’s Block of the Month in my Craftsy class. I wondered if I would have the patience to finish it. 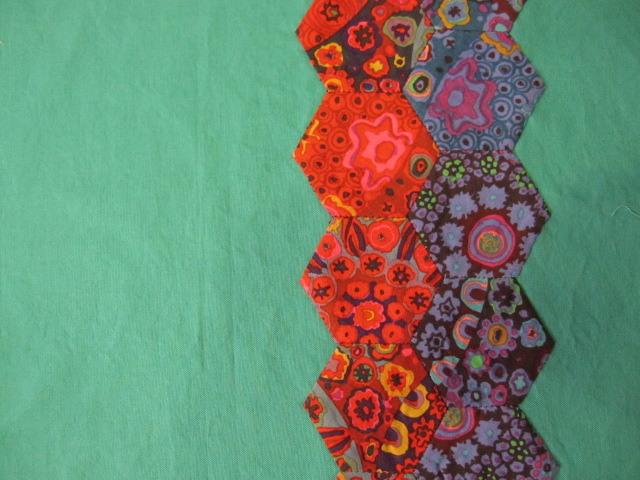 I actually enjoyed sewing the hexagons and then hand-stitching them to my background fabric. It definitely took longer than using my sewing machine. I’m quite pleased with the result! What has tried your patience lately? Cross stitching is one the best when you dont have a work or something to do, that's why I have lots of collection because sometimes when I'm boring I will go in our nearest mall to look some design.. It is beautiful. So glad you had the patience to work on it. I understand about the cross-stitching: that has always tried my patience too (and I only had to do the outline of a horse!). Mind you, I would not be much of a quilter either: too fussy by far! Man! That looks great. I wish I could quilt. My mom is really good too. Sigh. My recent post The McClain Sisters – Have You Ever Seen Such Sparkling Smiles? Well Go Girl!!! It is beautiful. Oh there are different levels of patience isn't there?